Downspouts are an integral part of your drainage system. 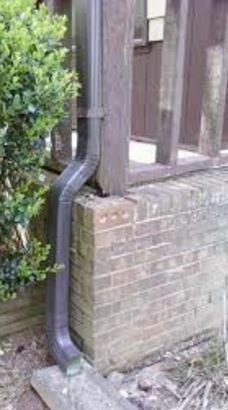 A gutter downspout is a hollow, pipe-like tube that collects the drainage water from the gutter and drains it away into the drainage or water renewal system.When you lack an efficient downspout system, water will flow directly from your roof to the foundation of your house causing severe problems. The areas you’re your house will always be damp, and moisture is one of the core factors that increase the spread of pests, mold, and mildew. These factors ultimately result in the weakening of your foundation.Therefore, it is essential you hire an excellent company with a team of skilled personnel experienced on how to fix downspout drainage. An ideal contractor will provide you with all downspout repair parts and will have extensive knowledge of how to repair downspout drainage. The materials required for repair will include;• Metal or non-metal (but mainly is metal) sheet which is fastened using sheet metal screws or pop rivets• A slip connector that fastens guttering pieces into a single structure• A sealant depending on your design• A strap, usually a conductor pipe band that helps to hold the downspout in place• Square elbows to facilitate turns and square shoe to direct water to a splash block, which is where the downspout ends. An excellent contractor will also offer downspout seam repair services since if your gutter is filled with leaf twigs and other debris, they block the movement of water. This also causes leakage of water to the walls and cracks in your home foundation. Experts in gutter installation have come up with half-round seamless gutters made up of stainless copper and steel that are efficient and still give your house an elegant look. The modern ideal solution on how to fix a downspout drainage system is to install an automatic recoiling downspout. This is a tube looking device made mainly from a flexible vinyl material. The recoiling downspout straightens out to its full length when rainwater comes down the drain spout. This facilitates the rainwater to be drained a further distance away from the foundation. When it stops raining, the recoiling downspout curls back into its original position (out of the way where it cannot injure anyone). This is a better alternative compared to a concrete trough or metal extension. It is crucial a contractor has adequate skills that ensure the repairs last longer. Obviously, you don’t want to continually call a repairing company to redo a downspout replacement they had done. Also, the downspout repair cost should also be fair and reasonable. ​Downspouts are significant to your household, but they are often susceptible to repairs. When you are looking into hiring a repair contractor, make sure they exercise all the above professional requirements. Luckily, Beaverton Gutter Pros Company are experienced in this line of work. We have a dedicated team to ensure that offer quality and yet affordable services to everyone.